Thank you to everyone who participated in the PATH Intl. Member Purchasing Preferences Survey this summer. All the prizes have been distributed. Your input is extremely valuable in helping PATH Intl. reach new sponsors and grow the support for your association. As an example of the information you helped us gather, 76% of PATH Intl. members share their lives with dogs, and 56% share their lives with cats. Thank you! PATH Intl. 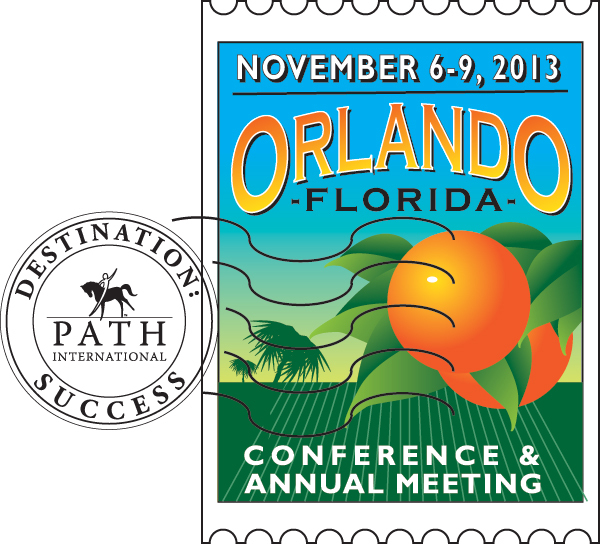 welcomes Equicizer as the latest pewter-level sponsor for the 2013 PATH Intl. Conference and Annual Meeting! Equicizer has generously donated a Classic Equicizer to PATH Intl. The Equicizer is a mechanical horse that simulates riding so you can improve overall fitness and practice skills. If you or your center have been thinking about getting an Equicizer, the timing is right. Check your budget and come prepared to bid on this $3,000 item at the live auction before the PATH Intl. Awards Banquet on Friday night at the conference. Bidding will start at $1,000. If you work with the visually impaired, two sessions will be of interest to you. First, "The Power of Vision" on Friday with Stephanie Clausen-Kubarth and Wendy Miklaszewski will show you how to screen for vision issues in your participants who may be undiagnosed and how to apply techniques to impact your riders. Then, during the Horse Expo on Saturday, the session "Alternative Teaching for the Blind and Visually Impaired: Equestrian Leadership" with Jack Wood and Carol Young will demonstrate a hands-on approach to working with this population in learning horsemanship. Audience volunteers will practice groundwork skills while blindfolded. If you are looking to share a room, suite or villa for the conference, check on the PATH Intl. website for a list of others who are looking or who have a room booked. If you would like to place your name on the list, email Cher Smith or call her at (800) 369-7433, ext. 123. The Greater Orlando area is home to 71 skyscrapers. The tallest is SunTrust Center in downtown Orlando, which stands at 441 feet. Orlando was originally named Jernigan, after the first permanent settler in the area, Aaron Jernigan. After being removed from his military position against his will, it was deemed inappropriate for the city to continue to hold the name of an officer with a negative reputation. In 1857 the city was renamed "Orlando." This year's conference theme of Destination: Success is highlighted in the success Kyle has had, but that success is not earned alone. It is found in partnership and teamwork, a collaborative effort of all involved. Kyle focuses his efforts first on creating a partnership between horse and rider, a partnership founded on mutual trust and constant communication. As Kyle sees it, partnership is the most basic element of success. Dr. Joahn Hall, a family practitioner in Kansas City, MO, and a PATH Intl. Board of Trustees member, recently gave a presentation to the residents and doctors at the Family Practice Residency program. The first 30 minutes of the presentation were in the classroom, but the fun started in the second half of the presentation when the class moved outdoors. The doctors and residents were able to interact with the horses in an equine activity demonstration in the arena Dr. Hall built in a grassy area next to the parking lot. "It was a lot of effort, but it was so worth it," she said. 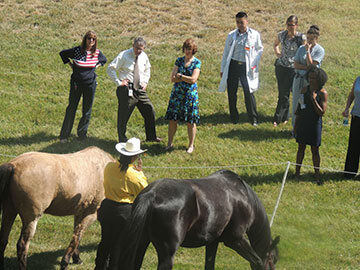 The presentation was met with such enthusiasm Dr. Hall (pictured on the right with the horses and doctors looking on) has been asked to present at the hospital's noon conference. A hearing is currently before the Connecticut Supreme Court that could have ramifications on EAAT centers. Lawyers for a Milford, CT, farmer warned that horse ownership could be changed if the high court rules that the animals are naturally vicious. The hearing centers around a 2006 case in which a young boy was bitten on the cheek when he tried to pet the animal. Click here to post on a Facebook page started to combat the ruling. Click here to sign a petition for the Connecticut Supreme Court to overturn the appellate ruling that all Connecticut horses are inherently vicious.